When you talk about killer plants, your mind may conjure images of a man-eating plant in “Little Shop of Horrors,” insect-eating Venus flytraps or poisonous plants like deadly nightshade. While all of those scenarios are interesting in and of themselves, what about plants that attack other plants? I’m talking, of course, about parasitic plants. These plants thrive on stealing nutrients from other plants, either weakening them or, quite possibly, killing them. Parasitic plants connect themselves to a host plant and siphon off the sugars that plant produces and the nutrients it pulls from the soil. These plants often bend the definition we have in our heads of plants, since they don’t have to behave like other plants that make their own food. Probably the most well-known (and beloved) parasitic plant is mistletoe. The plant that gives us the warm fuzzies and romantic feelings around the holidays makes its living by feeding off of the trees in which it lives. They don’t talk about that aspect of the plant in all those Christmas songs. It doesn’t kill the tree, but a heavy infestation can weaken a tree and slow its growth. While they are few in number, there are some parasitic plants you may run into. Another parasitic plant in our part of the world is the Indian pipe (Monotropa uniflora), a white, chlorophyll-free plant that resembles a smoking pipe as it unfurls from the forest floor. Without chlorophyll, it can’t make its own food, so it connects itself to a nearby tree (usually beech) for nutrients. Another plant, called a beech drop (Epifagus americana), also makes its living in the same manner. A plant called squaw root or bear corn (Conopholis americana), because it resembles an ear of corn growing out of the forest floor, is a parasitic plant that connects with the roots of oak trees. An infestation of dodder beginning in an annual bed. Photo courtesy Ann Berry. These plants may cause a little damage to their host plants. This week, though, there seems to be something more sinister afoot. I received two different calls about the same parasitic plant this week, from different parts of West Virginia (one of which came from Ann Berry, associate vice president for marketing and outreach at WVU). It seems that the problem here was with a parasitic plant called dodder (Cuscuta sp.). Despite the name, I assure you that this plant does not dodder around when it comes to feeding off other plants. 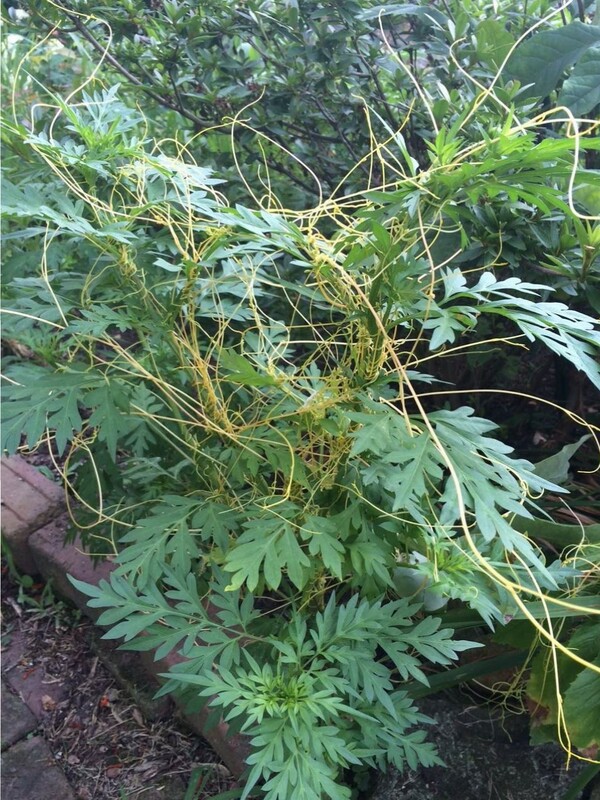 This plant can severely infect and potentially kill any plant it touches. Seeds of the plant germinate in the soil, so it starts life just like any other plant. Once germinated, though, the seedling has about 10 days to find a host plant to attach to and begin feeding. But this is not left to chance — it seems that dodder is a pretty good hunter. Scientists have determined that dodder can, in a way, sense chemical signals from nearby plants and grow directly toward them. Dodder is an odd-looking plant, and many people don’t even know to classify it as a plant. It grows in long strings, often without leaves (or only having inconspicuous ones). Different species can be different colors. The one that is most common here is often a yellow-orange color. Dodder, above, inserts a haustorium into its host plant. Once the dodder touches the soft tissue of a plant (leaves or stems), it inserts a structure called a haustorium into the plant. Haustoria insert themselves into the plants vascular tissue (veins) and siphons off the water, sugars and nutrients. 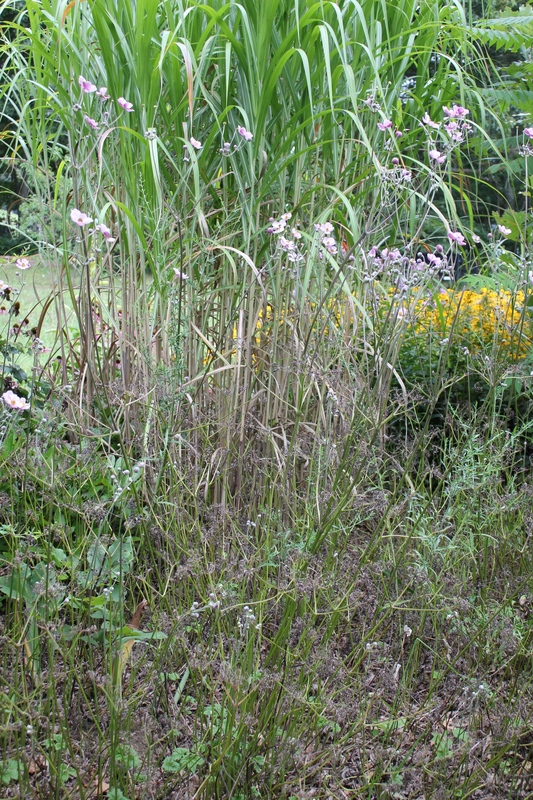 After the connection is made, the dodder plant detaches its roots from the ground and becomes completely reliant upon the host plant. Luckily it has trouble attacking woody plants, so it mainly goes after herbaceous ones. One connection is bad enough, but the dodder twines its way around the plant as it grows, resembling what some would call “silly string.” Everywhere the dodder touches the host, it sends in new haustoria to strengthen its connection. If other plants are close enough, the dodder will grow outward through the air to ensnare another host. It can easily grow to encompass many plants, covering them completely and eventually strangling them or starving them out. My advice to both of the callers this week was to remove as much of the plant as possible, as soon as possible. Unfortunately, the plant can regrow from the connections it makes with the host plant, so you often need to remove whole parts of the plant or the whole plant itself. If it has only made one or two connections, you may be able to control it just by removing the dodder from the plant. Dodder is hard to see on the ground as it germinates, so it is only usually spotted after it has attached and grown on a plant. If you do happen to catch it before it attaches to a plant, cultivating the soil to break it up and removing as much by hand as possible will help. Unfortunately, there is no spray or control method that will kill the dodder without killing the host. Dodder is definitely a bizarre plant that many have not seen. Keep an eye out for it this year, since it seems to be cropping up in unexpected places. It just goes to show you that sometimes it’s a plant-eat-plant world out there. This article was originally published 08.09.15 in the Charleston Gazette-Mail. You can find more article at wvgardenguru.com. You think YOU had a bad day…!?! Just downloading some photos from the end of the summer, and found this. 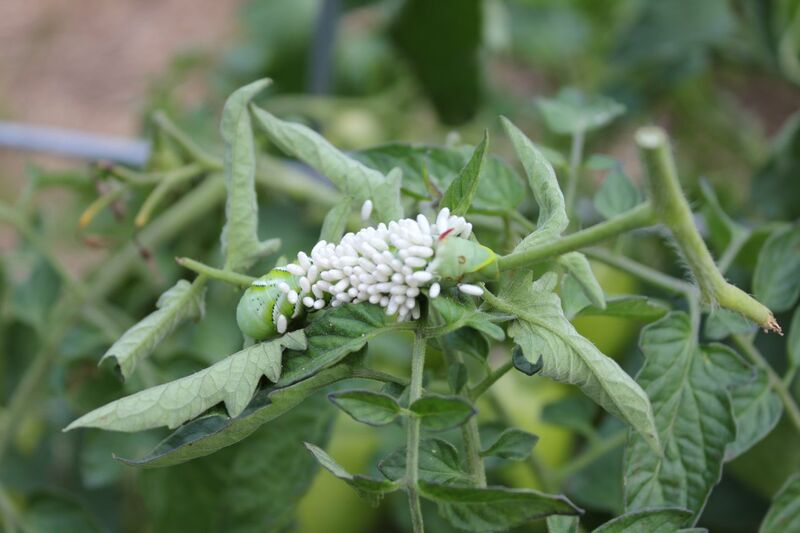 Rarely can I work up sympathy for a tomato hornworm (Manduca quinquemaculata). Though the moth is quite lovely, the caterpillars really did a number on my tomatoes (and two spindly eggplants) this year, and I recall joyously taking this photo in August. However, I’ve had a rough Monday, and can kind of relate to being covered in Braconid wasp pupae. The larvae have chewed their way through the caterpillar, to spin their grisly cocoons of death (would have made a great post a couple of weeks ago) and dangle there in the breeze until emerging. I know it is nature’s way, but, dang. Posted on November 10, 2014 Author Holly ScogginsCategories Holly Scoggins, Pest AlertsTags pests4 Comments on You think YOU had a bad day…!?! Which may be, upon further reflection, the most profoundly absurd statement ever when it comes to gardening. It’s nature! Of course there’s always something! Here in the Blue Ridge mountains of Virginia, we’ve had insect pests come and go, with each summer featuring something different. Two years ago? Chewing up everything in the vegetable garden plus lots of perennials… Blister beetles! Last year we had record rainfall, which brought out the gnats in gnumbers we’d never seen before. While not plant pests, they managed to take a lot of the fun out of gardening, hell-bent on clogging every facial orifice and nibbling on exposed flesh. Then the stinkbugs came. And stayed all winter long, keeping us company in the house. This season goes down as the summer of Popillia japonica, the Japanese Beetle. Holy cow. I’m no entomologist (let’s ask Dr. Jeff!) so I can’t speak to how we got to this lowly place. But in any gathering of two or more local gardeners, The Beetle Issue will come up immediately. There’s a ton of literature out there on life cycle, control, etc. They are a noted pest of turf, as the larvae munch away at the roots before emerging in early summer. I am not personally familiar with that aspect, as we don’t really have turf at our house; it’s a mix of white clover, orchard grass, broadleaf weeds, and some kind of fescue that that still make a decent green substance when mowed to 3.25″ (and viewed from a distance). If I come across grubs while pulling weeds or planting, I’ll call over a couple of hens to take care of business. Biological controls such as spores of bacterial Milky Disease and insect parasitic nematodes have been only marginally successful. For adult control, the debate continue regarding the efficacy (and wisdom) of traps baited with floral or pheromone lures. “Hey there, neighbor! 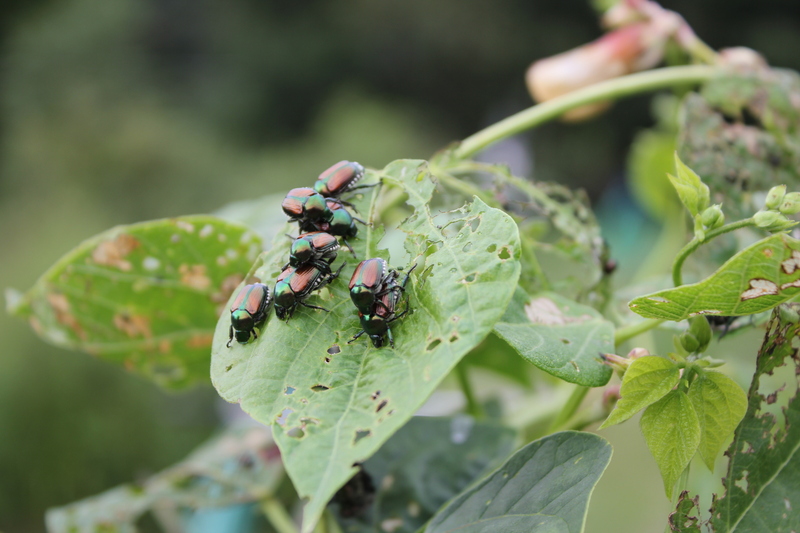 Mind if your Japanese Beetles come over to my place?” Most of the pesticides recommended in the literature are broad spectrum (pyrethroids, carbaryl, etc.) so, heck no on that count. Hand-picking them into a cup or bucket of soapy water to die a bubbly, fragrant death is an option for a small garden (and extremely patient gardener). Note chickens also enjoy the crunchy outer coating and creamy center; spiny, thrashing legs and all. Back to our regional plight – they attacked the usual suspects – favoring anything in the Rosaceae family including brambles,apple, etc. Any kind of Hibiscus now looks like a lace doily. Veggies were indiscriminately perforated – the beans were especially hard-hit. All that beetle poop is especially unappetizing on chard. A big surprise was the Japanese or Fall-blooming Anemone. They took mine down to the stem. I am currently enjoying flowers on a stick. There’s an “Anemone” pun here somewhere.. Both the Anemone and I will live, of course. But here’s the thing. One of the mantras that got us all through one of the coldest winters on record was “At least the bugs won’t be as bad this summer!” Ha, ha! If it’s not one thing, it’s another! Aargh. I’ve had several discussions with gardening folks in the region on one of our more annoying pests, the blister beetles. Big appetite, eats lots of things we value, and darned hard to get rid of. Someone invariable says “yep, they bite, too” and “be careful – you’ll get blistered.” However, I’ve yet to hear any first-hand experience with the personal-injury aspect of blister beetles. I’ve suffered from the heartbreak of blister beetles for two summers in a row. They’ve eaten ALL the foliage from the fall-blooming Anemone (leaving flowers on a steeck), badly damaged our chard and lettuce, and have turned their attention to the sweet-autumn clematis (Clematis terniflora). Perp: Epicauta funebris (Margined Blister Beetle) – chock full of Cantharidin, a caustic terpenoid. I went at the vines with gusto, gray and black beetles a-flying. Sure enough, I mushed one against my arm in gathering up the vines toss in the cart. Ouch. First, a burning sensation. Success! Then I watched with fascination as a bunch of welts popped out, at which point I ran and got my camera. The discomfort persisted through a couple of hours and a glass of wine. But by bedtime, my blisters were gone. No scars remain. So there you have it. Yet another example of the things Garden Professors do – so you don’t have to! Attention Pacific NW gardeners! Be on the lookout for the Brown marmorated stink bug. It’s been in the US for a while and is making its way westward. There are lots of stink bugs out there, so be sure to download the linked file to see what makes this one different. I know most of you are not residents of western Washington, but this information might be of interest to gardeners everywhere. Found: Images typical of late blight infection on tomato have been submitted from two Puget Sound area (King/Snohomish county) farms. Growing conditions were plants in field soil where the area was covered with a plastic hoop structure. Potential impact: Significant crop losses may occur if not managed properly. What action should be taken: Scout for evidence of the pathogen on the foliage, stems of tomato or potato, as well as the fruits of tomato. Look for black discoloration to the foliage and a halo of sporulation around the edge of the damage if conditions are moist. Keep the foliage as dry as possible. Maintain good air circulation around plants. A variety of preventative fungicides (both organic and conventional options) is available – click on the links above for tomato and potato. Information is also available on the PNW Plant Disease Management Handbook website. One of the things this blog can do is alert gardeners to the presence of new problems. This is one such instance. WSU produces Pest Alerts, and recently the Red lily leaf beetle has been found in the Seattle area. The state is monitoring the spread of this nonnative pest, so those of you living in Washington please read this and pass it on to your gardening friends. New Englanders have been dealing with this pest for a while, but any of you outside this region may want to keep your eyes peeled. Please comment here if you see this insect! It’s amazing how many things in life seem complex when we try to figure them out for ourselves but then we end up smacking ourselves on the forehead when someone shows us how simple it really is. The infield fly rule comes to mind. Some colleagues of mine here at Michigan State may be on their way to such a solution for the problem of white grubs in lawns. Drs. Dave Smitley (Entomology), Kurt Steinke, and Trey Rogers (Crop and Soil Science) are investigating the effect of mower height on turf damage from grubs. The premise is simple: White grubs damage turf when they consume about 75% of the turf roots present. Raising the mowing height of most standard mowers from 2” to the highest setting (usually 3 &frac12;”) also results in more root growth; often by more than double. Since there’s a limit to how much root mass grubs can consume, increasing the amount of roots ensures the damage threshold is never reached. The working hypothesis has been confirmed by greenhouse tests and now the researchers are taking to the field. This may turn out to be another example of how raising mower height and not trying to make your lawn look like a golf course fairway can reduce inputs and keep your turf healthier.